Thirty years may seem like a long time, but it actually takes longer than one thinks to go by. Dark Horse Comics made a splash on the comic book scene in 1986 with Dark Horse Presents and has since won plenty of Eisner and Harvey awards throughout their brief history. To celebrate their longevity, Dark Horse is releasing a new variant program which will continue throughout 2016. Every month, one comic will be selected to have a very special 30th Anniversary variant cover paying homage to a specific issue of Dark Horse Presents. Additionally, each issue serves as a perfect jumping-on point for new readers! Now on comic store shelves is the Hellboy Winter Special, which features Mignolaverse debuts by Tim Sale, Michael Walsh, Chris Roberson and Chelsea Cain. The Mike Mignola cover artwork is a throwback to the very first issue of Dark Horse Presents (1986). Continuing where the Rise of the Tomb Raider game left off, Lara Croft takes on fresh adventures in a new comic series by writer Mariko Tamaki. Hitting stands in February, the stunning variant cover by Joëlle Jones harks back to Dark Horse Presents #9 (1987). In March, Dan Abnett begins Predator: Life and Death, the first chapter in a new story cycle involving Predators, Aliens and the mysterious Engineers from Prometheus! The variant cover, drawn by Dark Horse senior editor Chris Warner, is a return to Warner’s original cover for Dark Horse Presents #35 (1989). And in April, Brian Wood brings his sharp storytelling to Aliens: Defiance, while Tristan Jones draws the scariest xenomorph you’ve seen in years. The variant cover features incredible artwork by original Aliens artist Mark A. Nelson and evokes Dark Horse Presents #40 (1990). 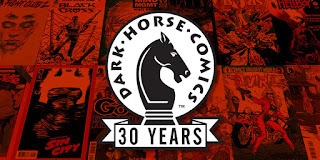 FOR IMMEDIATE RELEASE: MILWAUKIE, OR—2016 marks 30 years since Dark Horse Comics erupted onto the scene with their very first title, Dark Horse Presents. Since 1986, Dark Horse Presents has won multiple Eisner and Harvey Awards and launched some of comics’ greatest heroes. This week, Dark Horse is releasing a new variant program which will continue throughout 2016. Every month, one comic will be selected to have a very special 30th Anniversary variant cover paying homage to a specific issue of Dark Horse Presents. Additionally, each issue serves as a perfect jumping-on point for new readers! Now on comic store shelves is the Hellboy Winter Special, which features Mignolaverse debuts by Tim Sale (Captain America: White), Michael Walsh (Secret Avengers), Chris Roberson (iZombie), and Chelsea Cain (Heartsick, One Kick). The Mike Mignola cover artwork is a throwback to the very first issue of Dark Horse Presents (1986). Continuing where the Rise of the Tomb Raider game left off, Lara Croft takes on fresh adventures in a new comic series by Eisner Award–winning writer Mariko Tamaki (This One Summer). Hitting stands in February, the stunning variant cover by Joëlle Jones harks back to Dark Horse Presents #9 (1987). In March, Dan Abnett begins Predator: Life and Death, the first chapter in a new story cycle involving Predators, Aliens, and the mysterious Engineers from Prometheus! The variant cover, drawn by Dark Horse senior editor Chris Warner, is a return to Warner’s original cover for Dark Horse Presents #35 (1989). And in April, Brian Wood brings his sharp storytelling to Aliens: Defiance, while rising star Tristan Jones draws the scariest xenomorph you’ve seen in years. The variant cover features incredible artwork by original Aliensartist Mark A. Nelson and evokes Dark Horse Presents #40 (1990). More 30th Anniversary variant covers will be revealed soon, so make sure to head to your local comic shop to pick up these extremely collectible Dark Horse covers! TOMB RAIDER #1 (JOELLE JONES VARIANT COVER) | On sale February 17 | Diamond #DEC158392 | Retailers whose orders total 10 copies or more of the regular or variant cover will qualify to have their order made fully returnable. PREDATOR: LIFE AND DEATH #1 (CHRIS WARNER VARIANT COVER) | On sale March 2 | Diamond #JAN160128 | Retailers who order 15 or more copies of Predator: Life and Death #1 (any combination of the David Palumbo and Sachin Teng covers) are eligible to order any quantity of the 30th Anniversary variant. ALIENS: DEFIANCE #1 (MARK A. NELSON VARIANT COVER) | On sale April 27 | Diamond #FEB160011 | Retailers who order 10 or more copies of Aliens: Defiance #1 are eligible to order any quantity of the 30th Anniversary variant.